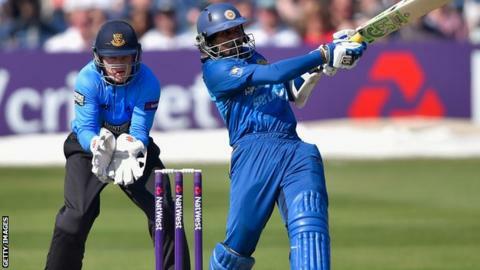 Tillakaratne Dilshan and Kithuruwan Vithanage both made half centuries to power Sri Lanka to a 10-wicket Twenty20 thrashing of Sussex. Dilshan struck 73 off from 31 balls and Vithanage contributed 52 off 24 as the tourists chased their target of 127 in only 9.1 overs. Sussex had earlier managed 126-7, anchored by 63 from Matt Machan. Sri Lanka, the world champions, meet England in a one-off T20 international at The Oval on Tuesday. That match is followed by five one-day internationals and two Test matches.